As I was cruising about the web this morning I stumbled upon Exorithm, an online PHP execution environment (or playground as I like to call it). Actually, it’s a lot more than that. It’s a hub for people to learn, create, and share. 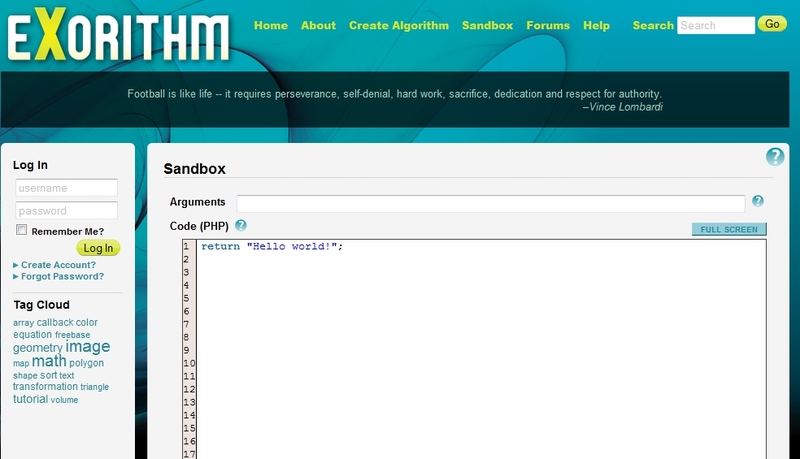 Exorithm allows PHP developers to create functions that other people might find useful and share them. For instance, just this morning there were algorithms on the site for reversing strings, drawing shapes, and sorting data. It’s worth checking out. I spent a good half hour just trying to break their evaluation environment (no luck!) and then another few minutes cruising the algorithms section. Their web site is http://www.eXorithm.com.